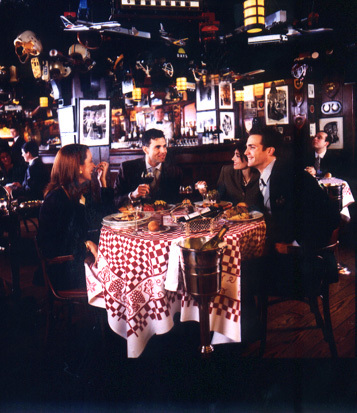 Renowned as one of the world's most dynamic eateries, the '21' Club is truly an American legend. Dating back to 1929, this four-story brownstone, former swank speakeasy has a reputation intertwined with America's own and still serves as a rite of passage for every president since Franklin Delano Roosevelt. Founded by two collegian cousins from the West Side, Jack Kriendler and Charlie Berns, the '21' Club quickly became the most exclusive establishment in town  a place where the young, rich socialites of the Roaring Twenties spent wild nights dodging the raids of Federal Agents. 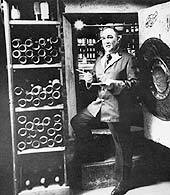 The famous two-ton brick wall, secret "door" still serves as the entrance to the private dining Wine Cellar and remains a constant reminder of those infamous days. Eclectic symbols of the people, companies and interests of the many powerful patrons abound both inside and out. 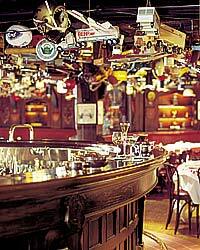 Beginning in the early 30's, the first "toy" donned the ceiling of '21's famed Bar Room  a model of British Airways "Flying Boat." Not to be outdone, Howard Hughes promptly appeared with one of his new TWA planes. Soon the ceiling was awash with model planes, trucks, cars, buses, footballs, baseballs, bats, tennis rackets, oil derricks, tankards, telephones, ice skates, ballet slippers  all with a story about an industry mogul, world leader, celebrity or other well-known personality attached to it. What has become a welcoming tribute to equestrians and racing enthusiasts everywhere began in 1942 when the first iron jockey was donated by Jay Van Urk as a symbol of his private horse farm. Thus, a new tradition was born and carried on by many of America's famous breeders and owners including such high-profile regulars as the Vanderbilts, Paul Mellon, Penny Tweedy - owner of Secretariat, Ogden Mills Phipps families, and the Galbreath clan, owners of Darby Dan Farms. 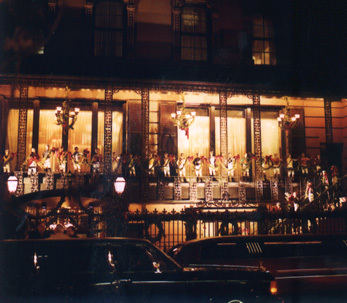 Today, the '21' Club remains a bastion of the quintessential New York dining experience. Still a world-famous, favorite haunt of the rich and influential, it is said that more deals are made at '21' than on the stock market floor. And, frequented by international personalities, business tycoons, political titans and a collection of stars like no other  Henry Kissinger, Newt Gingrich, Ethel Kennedy, Happy Rockefeller, Itzahak Perlman, Colin Powell, Lauren Bacall, Barbara Walters, Joan Rivers, Steve Case, Julia Roberts, Drew Carey, Carol Burnett, Whoopi Goldberg, Tony Curtis, Larry King, Muhammad Ali  you never know who might be at the next table! 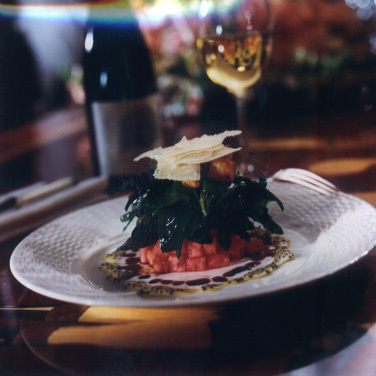 Master Chef, Erik Blauberg took the reigns in 1996 and has brought the restaurant's menu to new heights thereby raising the standards of excellence in Gotham. 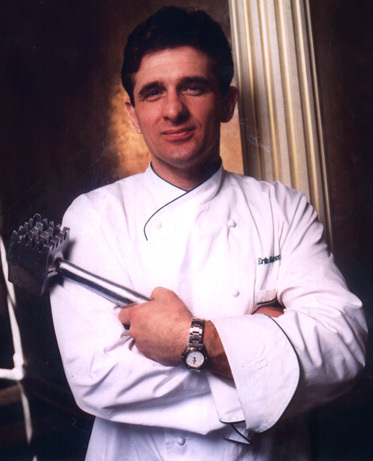 Rated by Zagat as one of New York's finest celebrity Chefs and recognized as a culinary Master and one of the "World's Great Chefs" by the Culinary Institute of America, he appears as a regular guest on the "Great Chefs" TV series. An active participant in many worldwide culinary events, he has been featured in segments on Regis, the Today Show, the Food Network, most major networks and numerous charity events. Blauberg's fascination with food began when he was 12, cleaning pots at a resort hotel in the Catskills where he was told to claim he was the owner's son if he "saw anybody in a suit." The following summer, he found himself grilling burgers and steaks for vacationers. Then, upon graduation from high school, he followed his father, a military man, to Kyoto where he landed a job at Kicho in Osaka and the Imperial Hotel in Tokyo, one of Japan's top restaurants where his future fate was sealed. 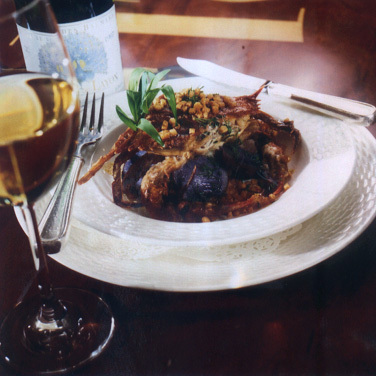 While touring Europe, Blauberg worked his way through the kitchens of French culinary legends Paul Bocuse, Alain Ducasse and Roger Verge. Upon his return to New York, his discoveries continued at Bouley, La Côte Basque, Windows on the World and the Tavern on the Green before being named Executive Chef at the Five-Star, Jalousie Plantation Caribbean Resort in St. Lucia, British West Indies. 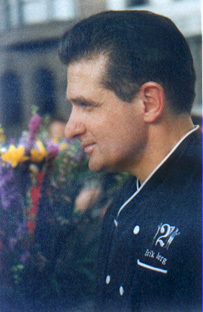 Returning home again, he established himself and defined his own creative style as chef/proprietor of American Renaissance and Colors prior to the Orient-Express Hotels snatching him up to revamp the newly renovated '21' Club, tantalizing the world's most sophisticated palates with inventive new dishes. 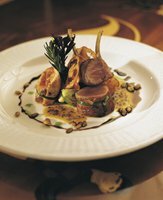 The impeccable reputation and unparalleled service is only outdone by some of the world's most harmonious crescendos of tastes and textures. 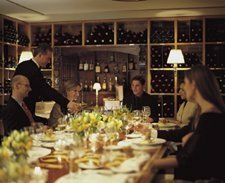 The kaleidoscope of culinary creations begins with appetizer offerings of Maplewood Fired Foie Gras with black mission figs and pomegranates, roast cedar plank Maine lobster with cauliflower truffle risotto or Carpaccio of venison with tête de moine and truffle-mustard dressing. Main courses defy description with offerings of crisp black sea bass with truffled potatoes and champagne sauce; mixed grill of game with Brussels sprouts and toasted pumpkin seeds, black grouper with oxtail, apple parsnip puree and corn broth; or the hickory-fired filet mignon with stone ground corn and chanterelles. Out-of-this-world desserts include Whiskey scented warm chocolate cake with caramel ice cream or the pineapple semifreddo with orange nage and coconut chip. 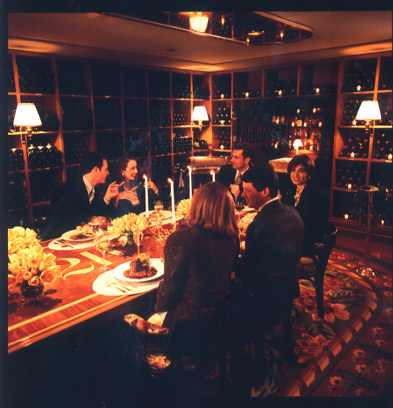 For the ultimate sensory overdose, the private Wine Cellar offers a tasting menu for $400 per person (maximum 20). 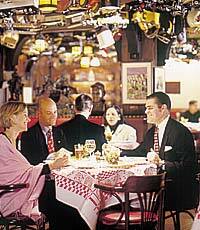 The fine wines menu consists of 950 selections representing more than 30 viticultural regions from 15 countries. And beyond his creative menu endeavors, Master Chef Blauberg has single-handedly raised the bar to what may be the world's ultimate Beluga caviar by altering the traditional recipe used in processing to his own unique inspiration. 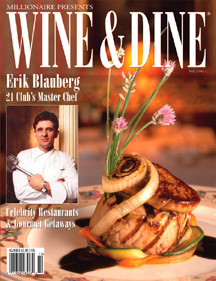 Additionally, Blauberg has authored the, Simply Elegant cookbook. On the Internet, you can find more recipes and information about cooking seminars at www.master-chef.com. Whether lunching in the Bar Room, sipping Champaign in the lounge or attending a private party upstairs, a visit to the '21' Club will be an historic culinary experience. Toss the croutons into a mixing bowl, add the dressing. Stir until lightly coated. Gently add the dandelion greens, toss until lightly coated. In the center of four plates, place the watermelon, then layer with the croutons, dandelion greens and top with Parmesan cheese shavings. Artfully drizzle the balsamic vinegar around the salad, serve immediately. In a wooden mixing bowl, add the egg yolks, then whisk in Dijon mustard, add the lemon juice, continue to whisk, add the anchovy, whisk well. While whisking, slowly stream in the oil until all is incorporated. Whisk in grated cheese and add the parsley. Stir in the caviar or trout roe. Season to taste with salt and pepper, reserve until ready for use. Season the crab with salt and pepper to taste, dust lightly with flour, carefully place the crabs into a hot pan with oil. Cook over medium to low heat for 3 minutes. Turn the crags over and add the thyme sprigs and continue to cook for 3 additional minutes. Then, remove the crabs from the pan and blot on a paper towel to remove excess grease. Place the potato salad in the center on 4 large bowls and place the crab on top and drizzle the sauce over. Garnish with tarragon. In a mixing bowl, add the potato, bacon, onion, bell pepper, carrots, celery and chives. Season to taste with salt and pepper. Add the lime juice and olive oil. Toss lightly and serve immediately. Place the mustard into a bowl, whisk in the vinegar. While whisking, Slowly stream in the olive oil. Add the chives; season to taste with salt and pepper. When ready to serve drizzle dressing over and around your food. Sprinkle with croutons. More stories by journalist, Kaya Morgan, can be found by clicking the link. Contact us for reprint rights as most articles are available.